The family virtues–based devotional provides 52 separate topics, one for each week of the year, and five devotionals within each topic that will guide devotional times Monday through Friday. This is a wonderful way to build a spiritually strong family week by week, day after day—a perfect way to head into the weekend. Topics range from the basics of the faith—such as salvation, spiritual warfare, prayer, forgiveness, and discipleship—to essentials of living as followers of Christ: money, prayer, family, friends, and priorities. The subject matter is simplified so even young children can grasp important concepts. This is a perfect resource for busy families. After reading Kingdom Woman by Tony Evans and Crystal Evans Hurst and hearing Tony Evans speak on several podcasts, I was familiar with his Kingdom Agenda philosophy which teaches that God has a comprehensive rule over every aspect of our lives which is demonstrated through the individuals, families, churches and society as a whole. (for more on this visit TonyEvans.org) This philosophy really resonated with me and made me excited to read the rest of the books of his, especially his Kingdom series so I was happy to receive this book in exchange for my honest review. I am so happy we have this book! Neither Matt nor I grew up doing any sort of devotional time with our families and as fairly new Christians, we are always looking for resources to grow our own faith and help our boys grow theirs. This book is wonderful for the whole family with weekly themes which are then approached in a variety of ways through the week. With 260 easy to lead family devotions, this book will last a whole year if used as the authors planned for it to be used with one devotion every day Monday through Friday. Each Friday's devotion includes an activity which can be used just on Friday or which sometimes leads to more family fun and learning through the weekend. We are still working our way through all the wonderful devotions and are eager to see what comes up next. I would highly recommend this title to any family looking to dive a little deeper in family devotions with little to no preparation required. 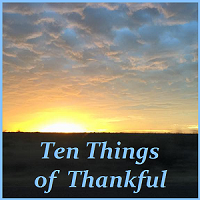 A friend of mine recently posted online about taking the time to find the beauty in every day which sounds a lot like finding the things to be thankful for. So this week, I looked for the beautiful in the everyday. As a homemaker/stay-at-home-mom/child caregiver/homeschool mom, a lot of my life is taken up in the mundane daily chores of running a home. There are always dishes to be done, food to be prepared, diapers to change and laundry to be done among other things so it can take some effort to find the beauty in each day. Some days it can feel like these two will never get along and then something as simple as climbing the same tree gets them working together and smiling. Hiking with two year olds is an adventure for sure, he's perfectly happy as long as he chooses each turn we take. Not so much when his brother gets to be the leader. These guys tend to make every outing in the woods into a survivalist game. Here they are reading the symbols on the tree and preparing for whatever may come. He was perfectly content with a mere 2 inches of water. He had enough to splash and cool off in. I've never seen lily pads in person before so this was really cool. I love flowers and I notice them everywhere. I'm already planning what to add around our yard next year. Most of these were spotted while walking in the neighborhood or at a park. Davis has been re-reading several of his favorite series' lately as he has finished everything published by his favorite authors, so we asked for a few recommendations to get him started on something new. This is the stack after he put several back, and it includes a couple he's re-reading. Our children's librarians are amazing, they came up with these and several others in a matter of about 5 minutes. This boy loves water. Any body of water, he's hooked. And this one loves to take the hard path because it's more fun. 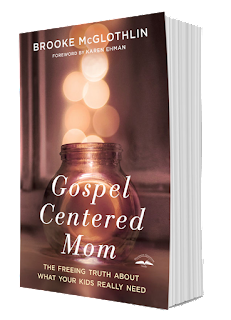 I’m so excited to be a part of Brooke McGlothlin’s Gospel Centered Mom book tour! This post was inspired by the book. Since becoming a mom, I have struggled with finding my purpose and coming to terms with the idea that I was called to be "just a mom" even if only for this season of life. Add to that struggle other life struggles and the fact that my husband and I have been blessed with 2 strong-willed boys and there are days and even weeks when I just want to give up. As I have begun to delve deeper into my study of scripture, I have found more solace and strength for this difficult journey but hadn't figured out a way to really apply what I had learned to everyday life. It was a situation where I would feel comforted and inspired while I was doing my daily Bible reading but not long after the kids got up for the day I'd find myself just as frustrated and at a loss about what to do about it. Then along came this opportunity, to read and be a part of the book launch tour for Gospel Centered Mom by Brooke McGlothlin. I have read some of her articles before and found them inspiring so I jumped at the chance, especially after reading the book description. I hadn't even finished the first chapter when I decided this was a book I would be reading several times to really let the knowledge sink in. As I hit chapter 9 I found myself highlighting multiple sentences on each page. My boys are strong willed and I know that will serve them well later in life but it can make for a frustrating parenting experience, and Brooke understands that as she has a strong willed boy herself. Her advice is spot on, learn to fight with them and for them rather than against them. I can't even begin to describe how helpful this book has been and I imagine it would be helpful to all parents, not just parents of boys or strong willed children. It helps you to realign your thinking to an eternal perspective rather than focusing solely on the here and now. It's so easy to get lost in the day in and day out of motherhood and lose sight of the end goals, this book inspires and challenges moms to look up and see the bigger picture. I'm still processing all the wonderful insights in this book and will be reading it again over the next few weeks more slowly to glean every bit I can from it. I would highly recommend it to every mom! Hi! I'm Elizabeth. I'm married to Matt and together we are raising and homeschooling our two sons. Davis is 9 and Tyrion is 2. We all love Jesus, reading and spending time outdoors. I hope you'll stick around and read about some of our adventures together! Elizabeth has read 20 books toward her goal of 45 books.